AMMAN, Jordan (AP) — Royal Jordanian turned a net profit in the first nine months of this year, after “many years of losses,” its new CEO said Tuesday, as he presented a multi-year plan to turn the national carrier into the No. 1 airline in the Levant. Stefan Pichler, a veteran airline executive, said Royal Jordanian hopes to become reliably profitable and not rely on help from the Jordanian government, its majority shareholder. Pichler said his turnaround plan includes luring new customers with fare promotions, adding more destinations and aircraft, adding more flights on existing routes and turning the country’s Queen Alia International Airport into a regional hub. 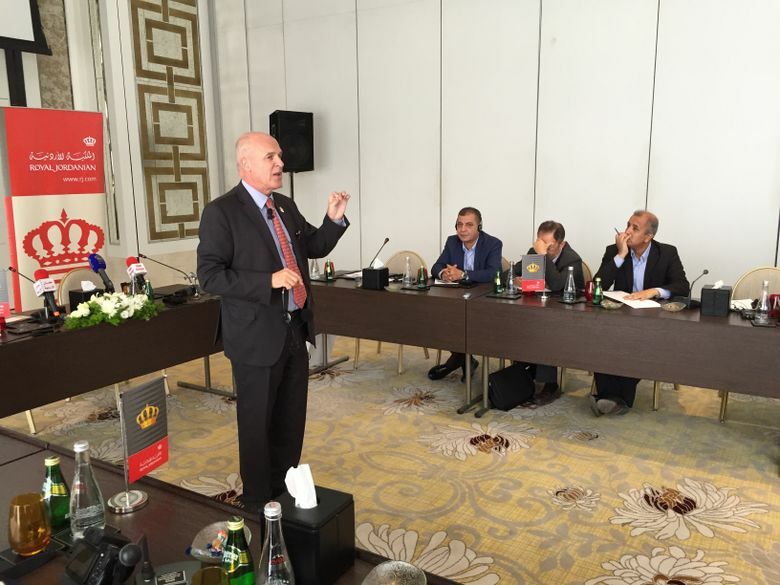 Royal Jordanian will not try to compete with the larger carriers in the Gulf or on routes to Asia, he said. “Our home market has to be the Levant,” he said, referring to countries east of the Mediterranean, such as Syria and Lebanon. Conflicts have disrupted airline service in the region, including to war-scarred Syria and Iraq. Pichler said he is confident markets will open up again in the next few years. He said he hopes to turn Jordan’s international airport into a connecting hub for flights between the Levant, Europe and North America. New destinations will include Washington, D.C., Copenhagen, Stockholm and Kyrenia in Cyprus. Royal Jordanian achieved a net operating profit of 5.4 million Jordanian dinars ($7.6 million) in the first nine months of this year, compared to a net loss of 2.7 million Jordanian dinars ($3.8 million) in the same period of 2016, he said. For almost two years, until January, Pichler served as CEO of Air Berlin, once Germany’s second largest carrier. Air Berlin ended operations last week, several months after declaring bankruptcy. Pichler had been one of several top managers brought in by Air Berlin since 2011 to try to rescue the troubled airline. Germany’s No. 1, Lufthansa, plans to take over more than half of Air Berlin’s fleet, but the deal has yet to win antitrust clearance. Lufthansa also expects to take on up to 3,000 of Air Berlin’s 8,000 employers. Pichler told AP on Tuesday that “in any company, it’s a little sad when jobs are lost,” referring to Air Berlin employees.